By now I think it’s pretty clear that I enjoy making pillows, they are easy to make projects and can be finished in one sitting. So, when Amy from Amy’s Creative Side asked me to take part in the Pillow Collective, I was all in. Plus, since the girls have been home from school due to snow, I have been totally distracted. I found myself checking out and sketching our newly rescued French Bulldog, Chewie. You see, even though only 1″ of “white gold” fell in this part of the world, it all but shut us down. Clearly, the south is not snow friendly! Here’s a quick picture of my scribbles for the day. The trick was going to be turning it into something stitched. (insert free motion sewing) For some reason, I was super intimated about this but after asking around, I just decided to dive right in! Now, I think I’m hooked! Switch out your standard sewing foot for your free motion open toe foot. (Foot “O” for my Babylock.) Depending on the make and model of your machine, you will need to adjust/drop your feed-dogs. My machine has a special button for free motion stitching so be sure to refer to your manual. Then let the games begin. I suggest starting slow with a small sample 1st before moving on to your project. Here was my test piece. Stitch slow and steady, moving your fabric as needed. Don’t worry, take your time and you will find a rhythm. Trim your loose threads or any long tails and dip/wash your fabric as per stabilizer instructions. Set aside to dry. Pick your pillow construction, add piping and insert your form. This type of pillow can be made with any design that comes to mind. From doodles to clip art let your imagination run free! Quilting gloves would come in handy for this type of sewing. They will give you a better grip on the fabric and prevent any oils from transferring onto your project. Work in sections and take breaks to look at the design on a whole. You may want to add more or wish you didn’t add those last stitches. I hope you enjoyed my French Bulldog design. Be sure to stop by and check out the rest of the amazing pillows shared during the Pillow Collective this week. 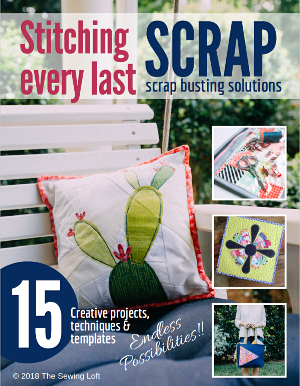 ps- Interested in learning more about free motion stitching? 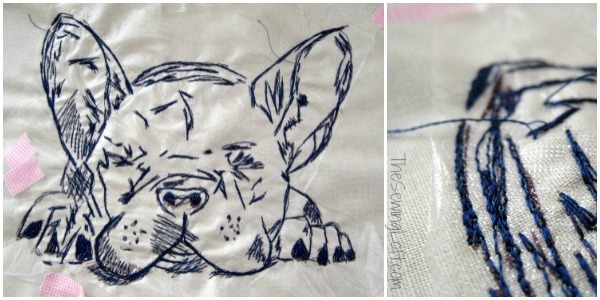 Leave me comment and I can share more than just my French Bulldog embroidery. Another great way to connect with me is via Facebook, Pinterest, Twitter, Google+ or Follow my blog with Bloglovin. I’m looking forward to getting to know you and creating together! Thanks Candace. He is a cutie! HI I am having a hard time drawing a frenchie. Do you have a sketch that you could send me so that I could try this with my machine? Thank so much! I love this idea for my Daughter!!!! So adorable!!!! Yay!! So glad you like it Sunnie. I just love the way he turned out and know that there is more free motion stitching in my future. It was a blast to create. 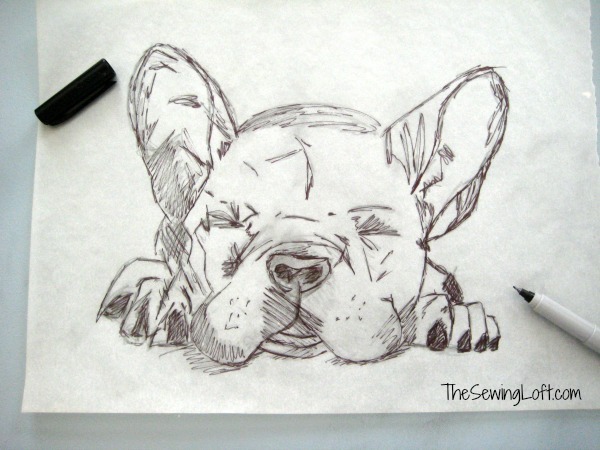 You did a great job on sketching and free motioning your new puppy. This is just the kind of project I like….a true original. Peggy, thank you SO much for your kind words. I was worried about putting my free hand sketch out there for all to see. Art is subjected and I have no formal training in this area. It made me very nervous on how it would be rcvd. 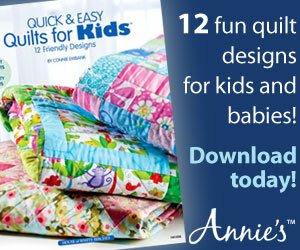 I’ve very intrigued by free motion quilting but as a new quilter, I’ve been afraid to try. I have the foot, now I have the motivation! I will be giving this technique a try soon. Love your dog bye the way! Yay!! So glad to hear that you are inspired to try it out. It is super easy and so much fun. Chewie thanks you! Very Cool! Would love to see more! So Creative and Different, I think it looks Great. I want to do one too! Thanks so much Betty! I love the way it turned out. It did not take long at all Kristin! In fact, I would say about 30 minutes. I kept taking it off the machine and looking at it to make sure I did not miss anything. I would love to see what you create! I love this. So talented! Thank you. Once the drawing was all set, it was smooth sailing. I believe that everyone can create this type of art. Thank you. Once the drawing was in place it was easy to create. With a little practice, anyone can create this type of project. this was the first time I happened on your site and I sure have to say that bulldog project was just awesome!!! I love it!!! I signed up for your news letter and am so looking forward to it, its very obvious you have soooo much talent!!! thank you for sharing it with us all. I’m so glad you found us Teresa! Welcome to the sewing circle. Can not wait to see what fun things you create! 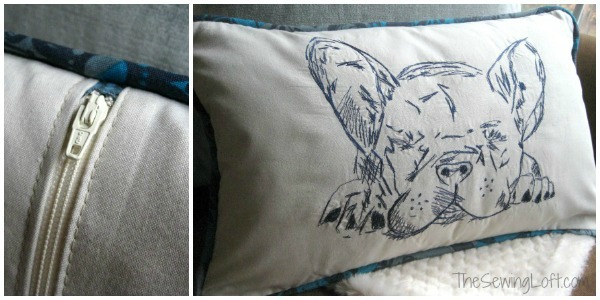 What kind of fabric did you use for the bulldog pillow? I just used cotton from my stash. You could use whatever fabric matches your decor best. So adorable! 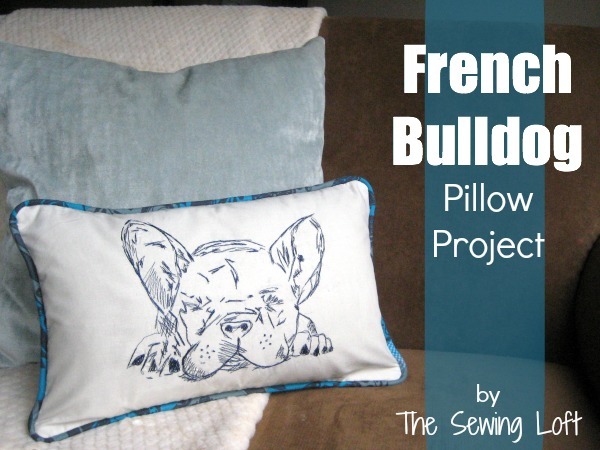 My daughter has a sweet French Bulldog so this project caught my eye while I was looking through Amy’s blog for the pillow collective. I would love to recreate this for my daughter! Frenchies Rule! My little guy is all personality. Give it a go and send me a picture. I would love to see it! LOVE this! 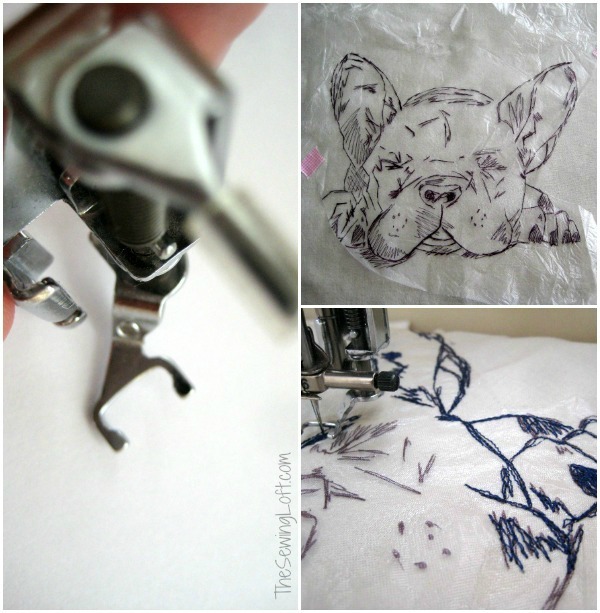 I found it in allfreesewing – Gonna sign up for your mailing list, dontcha just love those smooshy faces?! IMO they are the BEST (we have pugs) and rescued is the BEST kind of the best! So glad I found you!